And here is an answer that fell right into my lap. I was expecting that I would have to do this post on Jar Jar Binks because even though I don’t love him, not even a little bit, I feel the hatred of him is unwarranted, even perplexing. Actually what frustrates me about Jar Jar is that the public outcry undoubtedly influenced E2 and E3 in a negative way, and his suddenly decreased and yet persistent presence is actually more troubling to me than his entire E1 appearance. Frankly, I think he’s quite funny. So George Lucas entirely misunderstands his entire audience, but all the hostility and hatred has to get taken out on Jar Jar? Get real. He just wants to be your friend! To this day, I laugh when Obi-Wan has to duck Jar Jar’s ears. And I feel badly for Ahmed Best, too. This was not what he signed on for. I was a proud member of the Friends of Jar Jar back in 2000, and I continue that loyalty. But I don’t love Jar Jar. The question clearly asks for a character everyone else hates that I love. “This is impossible!” I thought, channeling Nute Gunray. What character, universally hated, could possibly be loved by me? Me, to whom hatred comes so much easier? Braving corners of the internet I generally try to avoid, I sought out lists of “worst Star Wars characters ever” and was astonished that one name kept coming up over and over. NOT YOU, DEX! NO!! Say it ain’t so! Dexter Jettster is one of the 11 most hated/most annoying Star Wars characters ever?! How could this possibly be? As you have already taken note, I have a thing about loving Dex’s Diner. In fact, this entire scene in E2 is about my favorite, where Obi-Wan travels to CoCo Town to ask an old friend about the mysterious dart that killed bounty hunter Zam Wessel. I love the parts in Star Wars that hint at the common, “real life” of the people, and this diner in the sunny commerce district just captures my fancy every time. Like I said, I don’t love Jar Jar at all; I like him, I am defensive of him because he’s done nothing to deserve hate, but he’s like the myriad other characters I’m just indifferent to. But I actually love Dexter Jettster. First of all, Obi-Wan’s warm relationship with this jack-of-all-trades (a former everything from prospector to restauranteur) emphasizes the influence that Qui-Gon had on him. 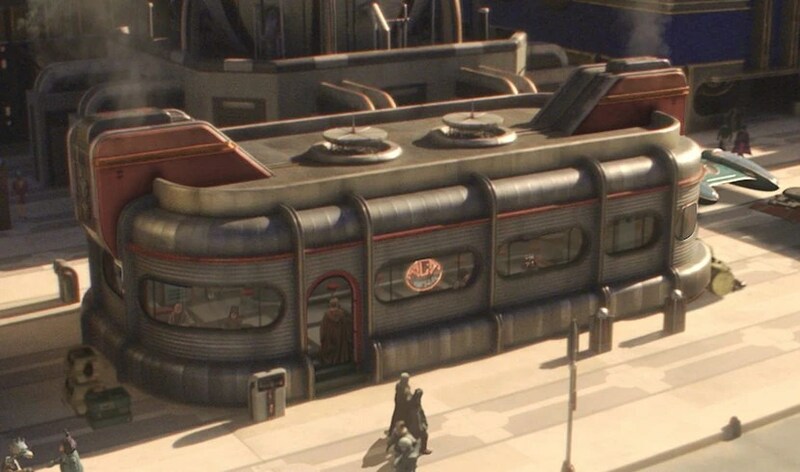 Qui-Gon was always turning to Jedi unorthodox locations for leads and hints, and this diner was a common place for Obi-Wan and his mentor to visit even before Dex purchased it. Dex’s warm rolling Besalisk purr is probably meant to conjure up the vision of a tough ’49er, but that and his stained t-shirt and broad hairy arms remind me of someone else . . . Terry Jaworski, an adjunct professor at UU whom I took Local Flora from in the summer of 2004. I can’t find a picture of him anywhere to show you, but he was the manager of Cedar Bog Nature Preserve for almost thirty years until his death on March 28, 2005. I didn’t have a drivers license that summer, and a lot of the class involved taking trips to various parks, preserves, even roadsides, so I usually rode with Jaworski (as I usually call him). I learned amazing things, not just about identifying plants — with which he had an incredible connection — but about the geology of the region, even animal behavior, history — it’s like there’s nothing he didn’t know about. He usually wore dirty blue jeans and a torn black t-shirt — managing a fen is no tidy business — and kept his watch pushed very high on his left arm. He’d stand with his five or six students in a semicircle, holding up some leaf or flower and telling us all about it in this gruff rolling voice. Dex will forever remind me of this man with the gray-threaded mustache, although Jaworski definitely did not have four arms. So there’s my defense for how much I love Dexter Jettster. I can’t believe anyone would dislike him. I love the scenes in Dex’s Diner — and I love this scrapped backstory Lucas originally hinted at, that the waitress Hermione (whom I also love) was supposed to be older and married to Dex. Instead, when she was played by a younger actress, she became this young runaway taken in and given a place to stay and a job by the kindly retired miner. This entry was posted on 18 April 2013 at 10:43 AM and is filed under Challenges with tags Attack of the Clones, characters, Coruscant, Dexter Jettster, opinion, prequel trilogy. You can follow any responses to this entry through the RSS 2.0 feed. You can leave a response, or trackback from your own site.